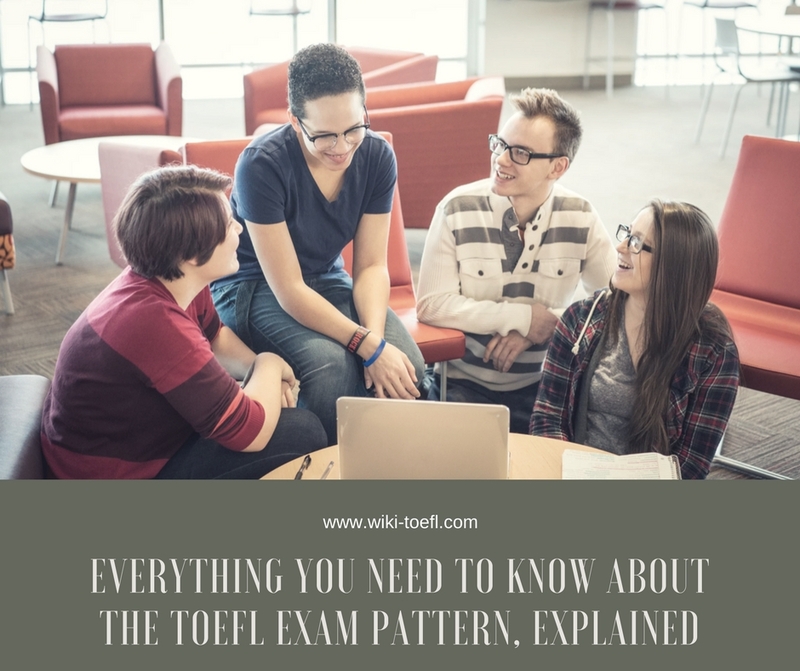 Do You Have Questions About TOEFL Exam Pattern? Learn About All 4 TOEFL Sections Here! When you think of the TOEFL, do you have lots of questions? Are you wondering what exactly the TOEFL is? Are you wondering which English language skills it will test? Welcome! That is exactly what we are going to discuss here. The TOEFL is an internationally recognized Test Of English as a ForeignLanguage. It is a long test that usually requires several months of study and preparation. And, if you are reading this post, I imagine that you probably need to take TOEFL. Maybe you are going to study in a foreign country. Maybe you will work for an international company. Great! It is natural to have many, many questions about TOEFL, its format and the overall exam pattern. The first step towards success is understanding what it will ask you to do. Understanding the TOEFL exam pattern is necessary, because it will help guide your preparation for the test. To study productively and get a good score, you really need to understand what to study for! Every TOEFL section (there are four sections in total) has specific questions and tasks. You may have never seen some of these questions and tasks before in your English classes, so it is very important to get some practice with them before your test day. The topics that are discussed and the specific questions that are asked will change all the time—but the format of the TOEFL never changes. The test always has the same format! That is why the following information is very important. The TOEFL consists of four sections: Reading, Listening, Speaking and Writing. The Reading section (60-100 minutes long) assesses your ability to understand and analyze written texts on topics like science and academic discussions. The Listening section (60-90 minutes long) makes sure you can understand information given to you orally—for example, when you listen to a lecture or speak to a professor at university. This section has four to six lectures and questions that test your understanding of the content, as well as your understanding of the motivations and emotions of speakers. The Speaking section (20 minutes) consists of six tasks that you complete by talking into a microphone during the test. It is meant to measure how well you can express your thoughts and ideas in English. And finally, the Writing section (50 minutes) is all about demonstrating how you can use your English in writing. Here, you will apply your knowledge of grammar and vocabulary and form clear sentences and paragraphs. Each section has a maximum score of 30, so the maximum TOEFL score overall is 120. This means that 120 is a perfect score. You are allowed to take notes during the test. You will be given plenty of scratch paper and a pencil—use them during the Reading, Listening, Speaking and Writing sections. You must give all the notes and unused paper to exam officers when you finish the test and leave! You can bring a snack and a drink to have during the 10 minute break. If you need to go to the bathroom or take another small break during the test, you can…but the test clock will not stop for you! Of course, no cell phones, tablets or other devices will be permitted into the room under any circumstances. You cannot use them during the official break either (sorry). Now, what should you expect from each of the TOEFL sections? What Is the TOEFL Reading Section Like? The Reading section presents you with three to five academic passages (pieces of text from academic texts or talks), each approximately 700 words long. The passages may be talking about a certain topic or about comparing several points of view. They can be scientific, historic and even philosophical. You will have from 60 to 100 minutes to complete this section depending on the number of passages and accompanying questions. The Reading section is a demanding one. It can be difficult, because the texts you will get are often complex—you should not hope for an easy passage with easy vocabulary. To do well, you need to be used to reading long and complicated paragraphs. You should learn to work with unfamiliar words to be able to infer (make a guess about) their meaning. Texts presented in the Reading section may have multiple focuses and arguments. The time limit also creates difficulty, as you will have to read fast. What Is the TOEFL Listening Section Like? You should expect to listen to four to six lectures that deal with academic topics. Conversations are more casual, so there are usually only two to three of these. Each bit of audio can be from three to five minutes long, followed by five to six questions. The questions may ask you about the contents of the recording. They may also ask you about what you think happened before or what could happen after. There could also be the “why” and “how” type of questions. You will hear every audio lecture or conversation only once. There is an exception: Some questions will play back a part of the recording for you to listen to again. However, you cannot depend on this. You should expect to only hear the audio once. Hearing something only once is the major difficulty with the Listening section. This is why you will need to take good notes and make educated guesses about what questions you could get. Understanding conversational English is also one of the hardest tasks for English students, so it is very important to get used to listening to many types of talks and dialogues. The TOEFL has a policy of including different English accents in the Listening section—you could hear American, British, New Zealander and Australian English on the test! Try to listen to all these different types of English before taking the exam. To prepare for Listening, seek out English-language movies, TV shows and YouTube videos (these are particularly helpful with understanding accents). Use FluentU as much as possible. Listen to recordings of lectures and practice taking notes during them. Be sure to expose yourself to many different kinds of English by watch American news and listening to British radio, too. Doing this regularly enough will improve your listening abilities without you even noticing. TOEFL has a 10-minute break in the middle of the exam, and it is mandatory, which means that everyone must stop. You will be asked to leave the room—and you should! Use this time to walk around, stretch your legs and your back, eat your snack and drink your beverage. Go to the bathroom, too! 10 minutes will fly by very quickly, and you really need them to rest, recharge and get ready for the second part of the rest. Taking a break makes it a bit easier to pace yourself. Reading and Listening are now behind you—forget about them. After the break, it is time to start the Speaking and Writing sections. What Is the TOEFL Speaking Section Like? This is the newest addition to TOEFL. Can you imagine that only a few years ago test-takers did not have to go through it? Now Speaking is an important part of the test. It judges your ability to speak good English and it can be quite hard. You will not have an interviewer to ask you questions and listen to your answers, you will only have a microphone. Your voice is recorded and someone will listen to your answers later. There is very little time to answer each question, and there is even less time to prepare each answer before you start talking. Speaking is the hardest part of learning any language. You will do your best if you know what to expect from this section. You will be given six Speaking tasks in total. Two of them will ask you to express an opinion on an everyday topic. This is the Independent Speaking section. For the Independent Speaking section, all you will hear is a question. You will not need to listen to a long recording or read any long passages. The four remaining tasks will require you to discuss something that you read and hear. This is the Integrated Speaking section. For Integrated Speaking, you will read a short passage or hear an audio recording followed by a question. You will have up to 30 seconds to prepare a response and up to one minute to record it by speaking into a microphone. This TOEFL section is the one where taking notes will be the most useful. Once you hear the question, write down some ideas to look at them when you speak. Practice your timing, but do not speak too fast, even though you may be nervous. Remember that your accent is not important—all that matters is that you speak clearly and present some good ideas in your answer. Breathe! You will do just fine. What Is the TOEFL Writing Section Like? All your English skills come together in the last section of TOEFL. This last section is the Writing section. It is the section that judges your writing ability, grammar knowledge and vocabulary usage. Writing consists of only two tasks: one Integrated Writing task and one Independent Writing task. The idea behind these tasks is similar to the Speaking section tasks. For the Independent Writing task, you will write an opinion on a casual topic. You will get a question to answer, but you will not need to listen to a long audio recording or read a long passage. To learn more about the Independent Writing section, click here. For the Integrated writing task, you will write an essay based on additional reading and listening material. You will have more time (30 minutes) to spend on the Independent task than on the Integrated task (20 minutes), so you will be expected to deliver a very good essay on the former (the Independent task) and a slightly shorter answer on the latter (the Integrated test). Taking notes and creating an outline of your answer is very useful during both parts of the Writing section. The only way to prepare well for TOEFL Writing is, of course, writing as many practice essays as possible. Remember that your actual opinion does not matter in the Writing section. You can say that you love cold winters and that you hate ice cream, even if you do not. The people grading your essay will look at how well you support your argument and how well you explain your choice. The structure of the essay and clear, grammatically correct sentences are what matter most. Practice writing essays with a proper introduction, main body and closing paragraph. Refresh your grammar. Learn to use connectors like “therefore,” “however,” and “although” to make your essay flow better. Do not try to use too many long words, especially if you are not sure what they mean. Go for quality, not quantity! TOEFL is a hard test, there is no doubt about it. But you can succeed. You should register for it well in advance, giving yourself at least three or four months to study and prepare well for it. And be sure to take a complete TOEFL practice exam at least once. You’ll not only take a TOEFL practice exam that feels just like the real thing, you’ll also get feedback from certified TOEFL teachers and tons of interactive study tools. This is very important if you want to be fully prepared for the actual exam day. The format of the test never changes, which is great news for you! This means that finding study help and resources is much easier. You only need to learn about the format of the TOEFL once. Once you get it, you will be able to make up your own study schedule, focus on areas of your English to improve and ultimately increase your chances of success on TOEFL.